Why weren’t locals contracted to produce SSB uniforms, which cost over $ ¼ mil abroad? BELIZE CITY, Mon. 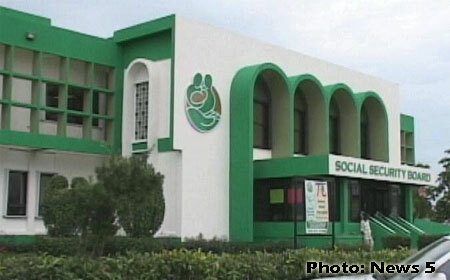 Oct. 19, 2015–It was on Monday, October 5, that the workers of the Social Security Board (SSB) countrywide staged a half-hour protest during their lunch break over the alleged withholding of their uniform allowance by the Social Security Board. The response of the SSB chairman, Doug Singh, suggested that the workers were being unreasonable. On Thursday, October 8, the staff held a press conference at the office of the Christian Workers Union, where it was revealed that it had been previously established under the Collective Bargaining Agreement (CBA) into which the union and the management of SSB had entered, that every 18 months the uniforms should be ready, and if those uniforms weren’t delivered on time, the staff would be paid a clothing allowance to compensate them for the period during which they had to find their own clothing. The workers’ accounts of what they have been dealing with tend to paint a picture of a hostile environment. They seem to be implying that the Board has been withholding several benefits from them and the uniform issue seems to be the last straw. The workers decided that they would not take it anymore and staged a number of protests as well as a press conference to tell their side of the story. Well, on Wednesday, October 14, Prime Minister Dean Barrow got involved by meeting with some of the staff while the others, about 80%, staged a sickout. 9. The disconnect between Board and Non-Managerial Staff which is reflective of ineffective communications shared by both the Board and its Management Staff. According to the letter, two issues were resolved at the meeting: the disclosure of the financials, which were sent to the CWU’s office and the pledge to pay the clothing allowance of $450 for staff and $600 for management, which Barrow promised would be paid, although he did not give a date. The president of the Christian Workers Union, Audrey Matura-Shepherd, told Amandala that it was never the employees’ desire to have their uniforms made abroad. The staff had never known the cost of their uniforms until they became aware of it via the news, along with the rest of the country, when the SSB chairman revealed to the media that it cost $277,000.00. Matura-Shepherd questions the wisdom in management decisions to source these uniforms outside Belize. “It is sending like quarter million dollars abroad that can remain in our economy, that the local tailors and seamstresses can benefit from,” Matura-Shepherd said.